The gates are down as millions of educated families and communities are now storming the crumbling GMO empire. The American GMO experiment has fallen in the court of public opinion. Lost are the hearts and minds of the people as the mainstream media is forced to reflect the wave of popularity. At every level biotech is failing on record. Medical literature and research has been unshackled and allowed to finally report the reality of these dangerous toxins. Financial institutions and bottom lines are taking unsustainable hits destined to do irreversible damage. Grocery chains, forced to listen to their consumers, have spotted the trend long ago and are scurrying to make changes. The quickening away from genetically modified organisms is upon us. More is happening in a week than happened in months and years past. This is what a shift in consciousness looks like. In one week, the United States has seen numerous events happen to signal this major shift. Biotech board rooms have to understand that it is one minute to midnight for their entire industry. Unsure of what the final blow will be, it appears that the American GMO experiment is being taken down from numerous angles all at once. Young had his wishes granted as Vermont made history by finally overcoming the legal battle to officially become the first state to have mandatory GMO labeling laws. After much anticipation and waiting, a law whose time has come will take effect July 1st, 2016. As Minnesota, Texas, and Massachusetts appear be next up to label, the dominos are falling. Shortly after, it was announced that the people of California have brought a class-action lawsuit against Monsanto for “deliberate falsification to conceal the fact that glyphosate is harmful to humans and animals.” With numerous scientific studies and a recent World Health Organization “possible human carcinogen” classification, it appears this case will take flight rapidly. The Daily Show and Jon Stewart kicked off another losing round for the biotech industry by running its third, well timed installment of comedic rebellion against GMO foods. This time, Stewart and crew were joined by Jeffrey Smith of the Institute for Responsible Technology. The duo served up a one-two punch to GMO integrity now barley conscious after a concentrated week of relentless public relations pummeling. The focus was to end the roll out of the new GMO potato and apple already showing disastrous health concerns. Finally, we come to the mainstream media who, in the past, showed firm allegiance to a biotech industry that paid their allowance. After running his now notorious “glyphosate” episode, Dr. Oz suffered a poorly thought-out and transparent character assassination. Immediate investigative journalism from the alternative community exposed Oz’s attackers as convicted medical frauds and paid biotech shills. This served to vindicate Oz and expose the power of biotech money and reach. An added bonus was to show the public how all major media outlets and reporters running the initial attack piece were sloppy, dangerous, and inaccurate with their reporting. The mainstream media was checkmated and was forced to report the obvious facts grasping for what little influence they have left. Perhaps for the first time in history, the media outed itself for lying about its own fabricated attack. Oz then stepped up to the plate in his latest episode to double down on his call for GMO labeling. On the financial side, the losing continues across the board as Monsanto’s stock pricetanked %15 in the second quarter of 2015. To make matters much worse, the Organic Trade Association just released its 2014 totals for U.S. spending showing an 11% increase from the previous year to $39.1 billion. 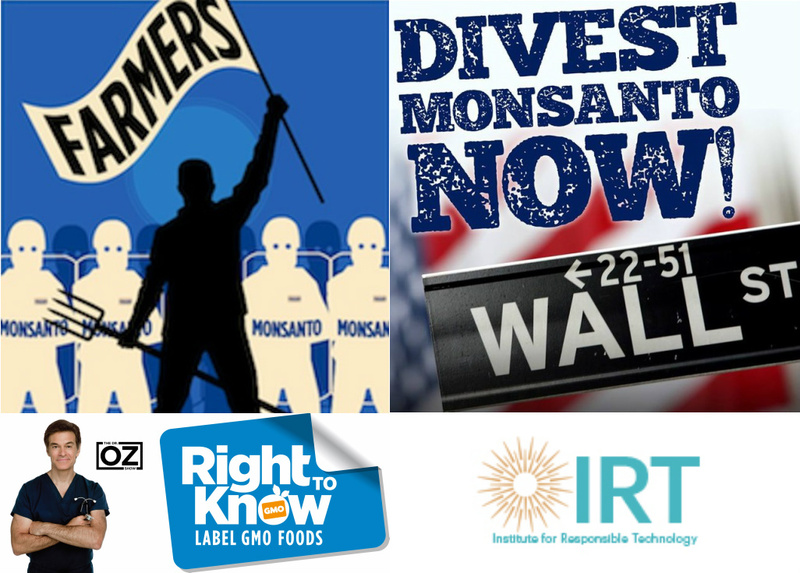 Perhaps the sleeper and near-future death blow to Dow, Monsanto, Sergenta, and other biotech mega-corporations is the grassroots Trew boycott Hedge Fund. A tool previously not available to the non-GMO crowd, Max Keiser’s revolutionary paradigm shift in investing essentially represents financial karma on corporations that abuse the people and environment. By changing the way investing is looked at, the fund seeks to simultaneously give investors rapid, profitable returns while also punishing the stock prices of vulnerable companies engaged in bad business.